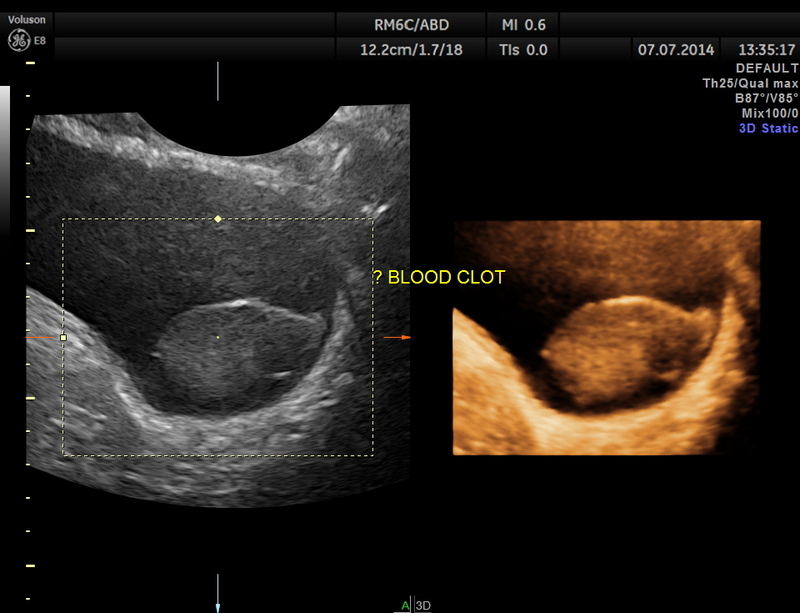 This was a 40 year old gentleman with obesity and systemic hypertension . He was on tab losartan 50 mgm once daily and his B.P. was well controlled. He came for complaints of frank hematuria and passing clots of blood since 5 AM and right loin pain since 9 AM . 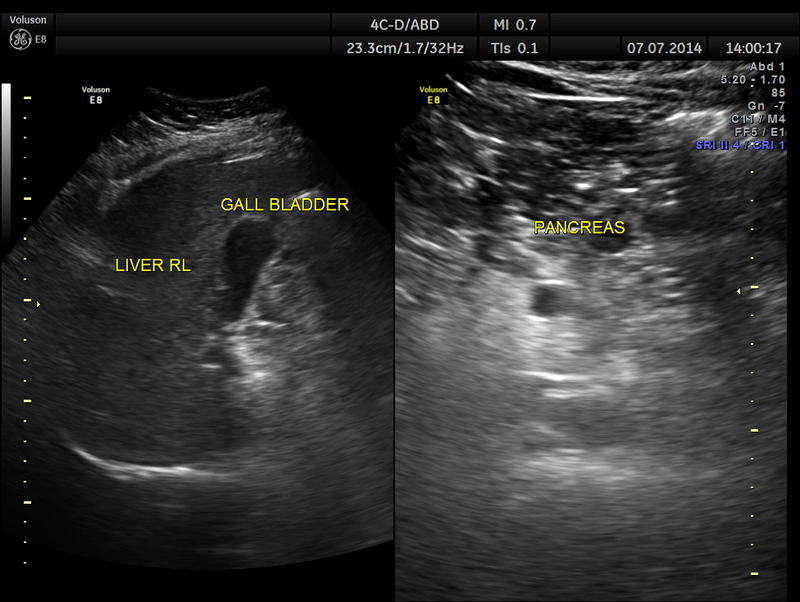 The urinary bladder showed ? 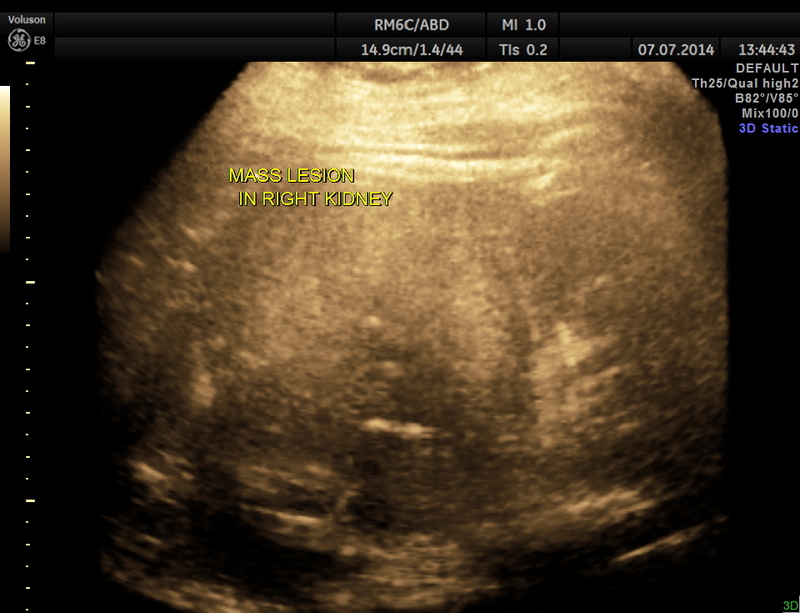 mass lesion at first look. 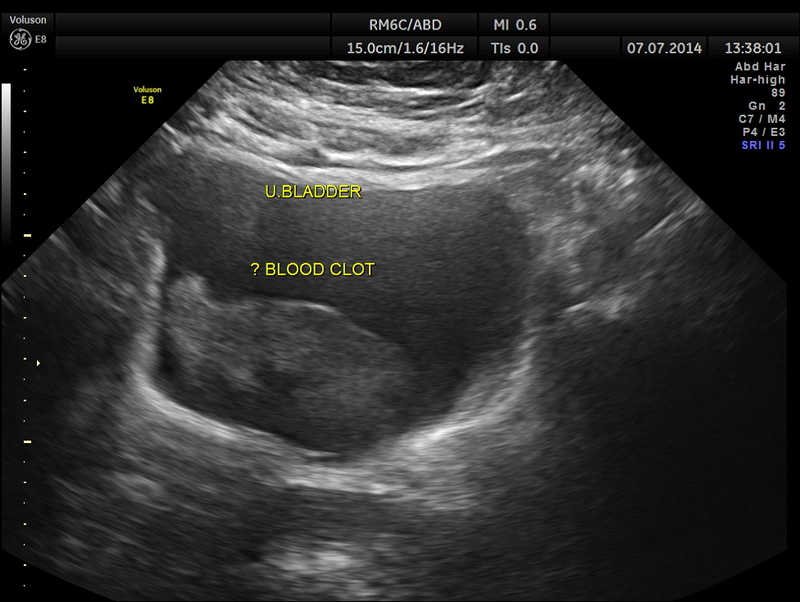 With change of position this ” mass ” was seen to roll within the urinary bladder , suggestive of blood clot. 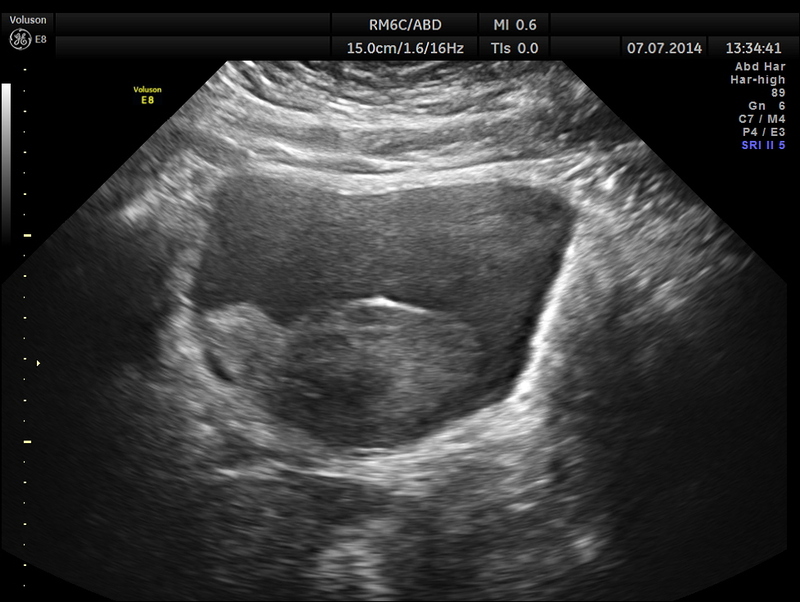 The right kidney is shown below. A solid mass is seen in the lower pole region. 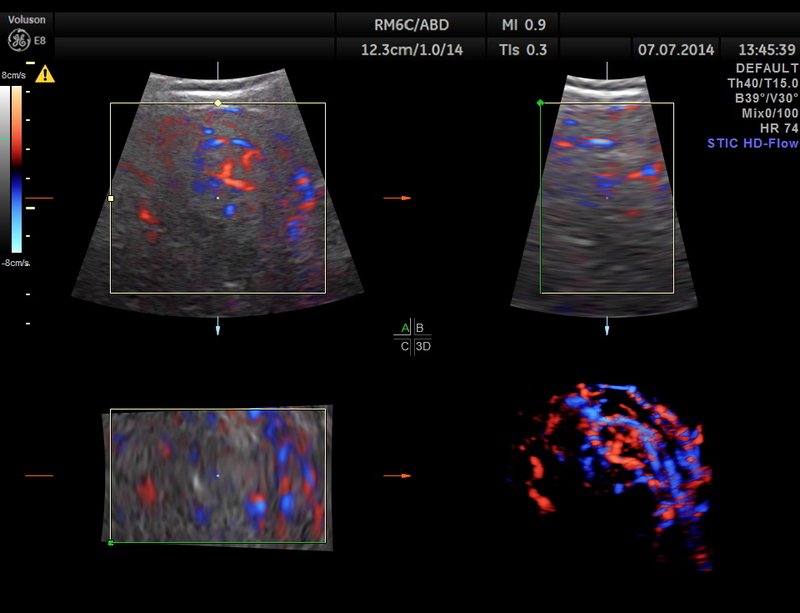 The mass shows increased vascularity on Power Doppler. The mass measurements are given below. GLASS BODY RECONSTRUCTION shows increased vascularity. 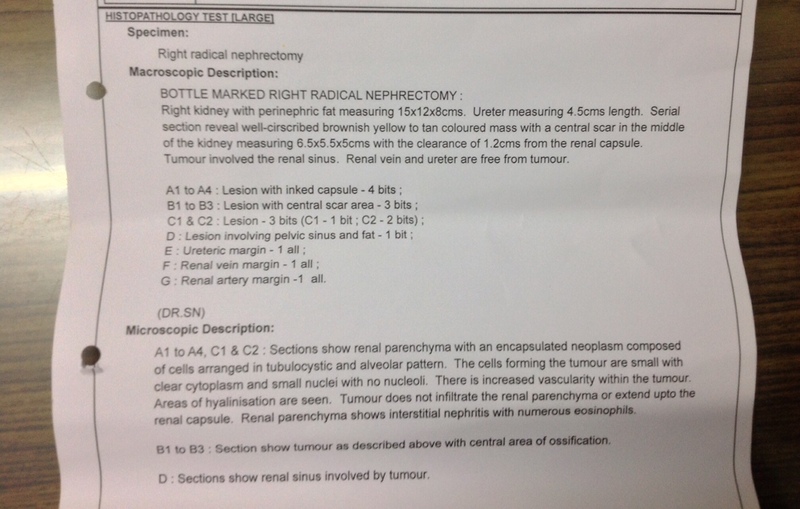 The left kidney appears to be normal. The patient underwent further investigations to rule out any spread and was found to have a localised tumour and was taken up for robotic surgery . He underwent surgery successfully . 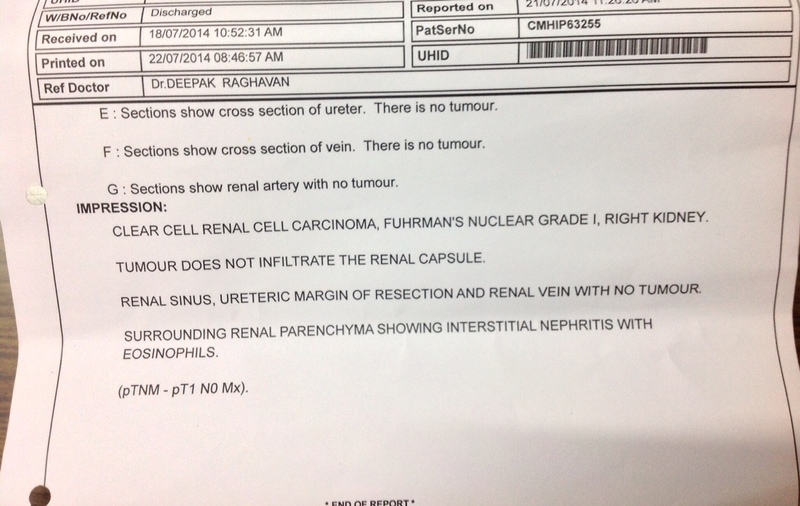 His histopatholgy came os RENAL CELL CARCINOMA – CLEAR CELL TYPE , with no involvement of the renal vein , ureter or renal capsule. The following references could be useful. Renal cell carcinoma (RCC, also known as hypernephroma, Grawitz tumor, renal adenocarcinoma) is a kidney cancer that originates in the lining of the proximal convoluted tubule, a part of the very small tubes in the kidney that transport waste molecules from the blood to the urine. 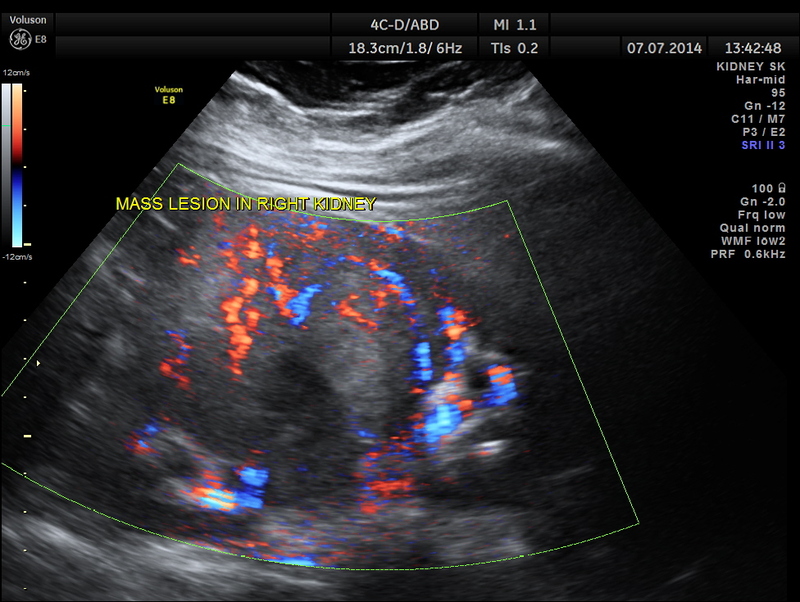 RCC is the most common type of kidney cancer in adults, responsible for approximately 90-95% of cases. 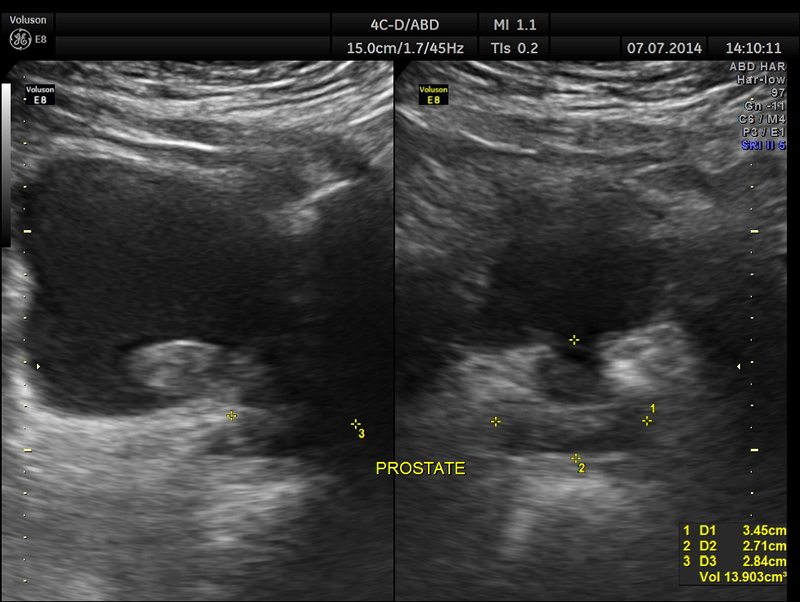 It has been described as one of the deadliest of cancers affecting the genitourinary tract. 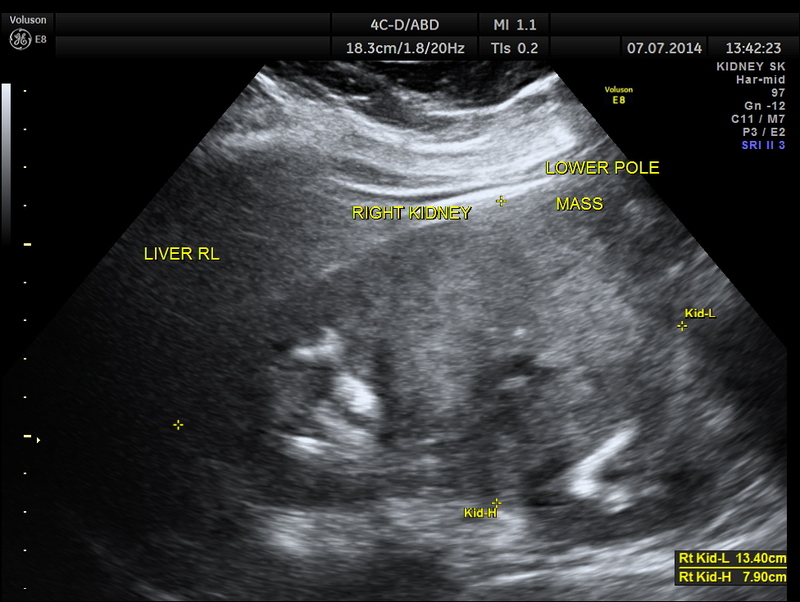 Initial treatment is most commonly either partial or complete removal of the affected kidney(s) and remains the mainstay of curative treatment. Where the cancer has not metastasised (spread to other organs) or burrowed deeper into the tissues of the kidney the 5-year survival rate is 60-70%, but this is lowered considerably when the cancer has spread. It is relatively resistant to radiation therapy and chemotherapy, although some cases respond to targeted therapies such assunitinib, temsirolimus, bevacizumab, interferon alfa and sorafenib which have improved the outlook for RCC. 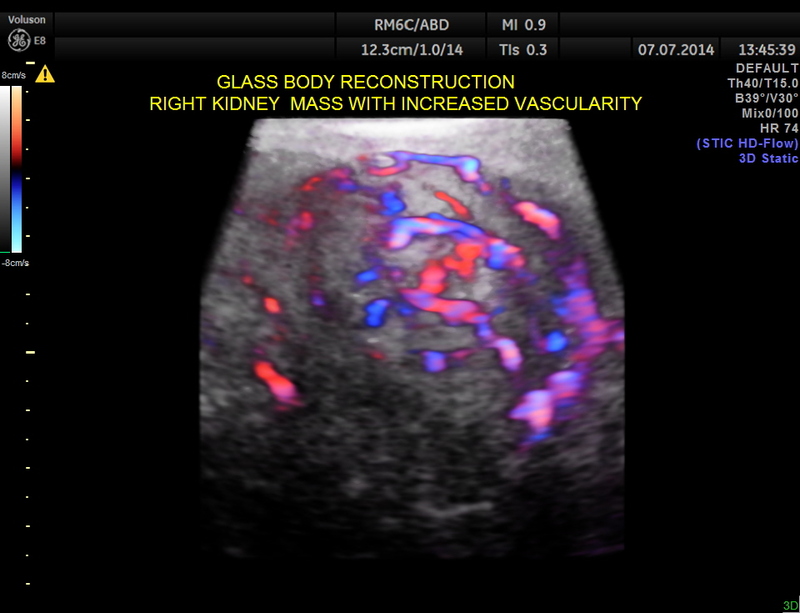 In this patient the increased vascularity is brought out very well by glass body imaging . 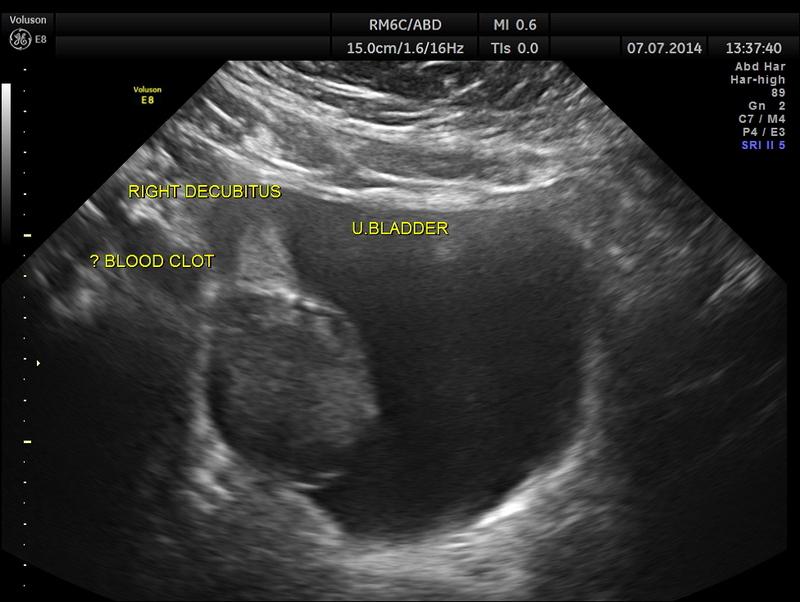 Clots of blood seen in the urinary bladder gave the false impression of a mass lesion in the bladder initially.The importance of a dynamic study of turning the patient to the sides should always be remembered. 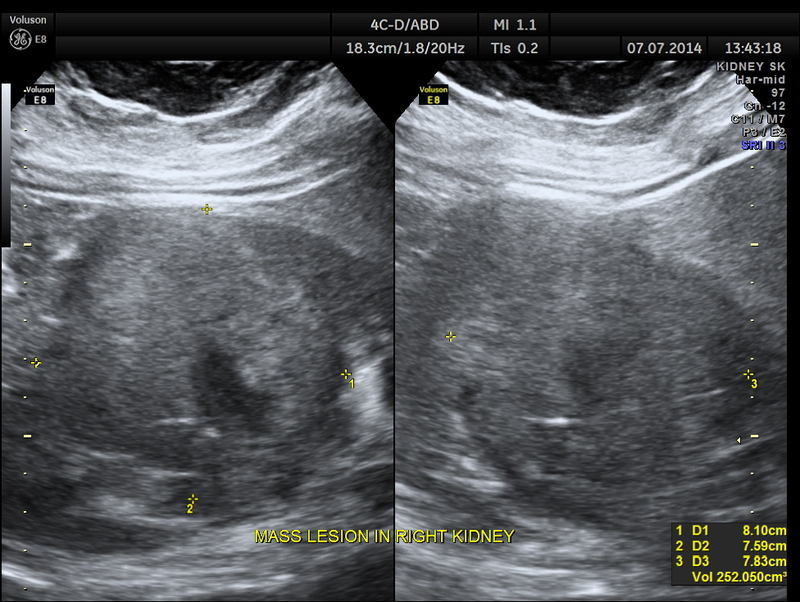 In this blog ” Looking through a transducer ” , this is the third case of renal mass with increased vascularity . 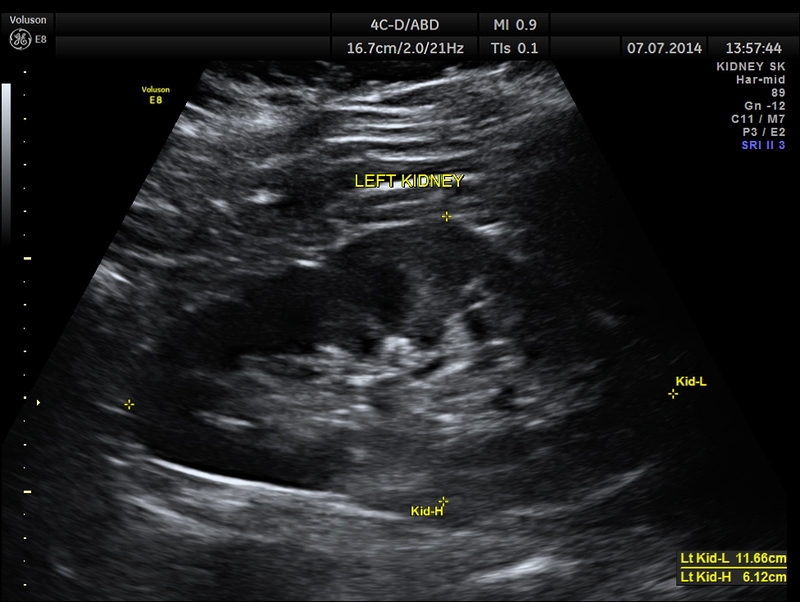 Two were confirmed to have hypernephroma and one was lost for follow up. Please visit our earlier posts also. Very good presentation, Clear informative images. Wonderful case study. The images were great as well. I enjoyed seeing your investigative skills. 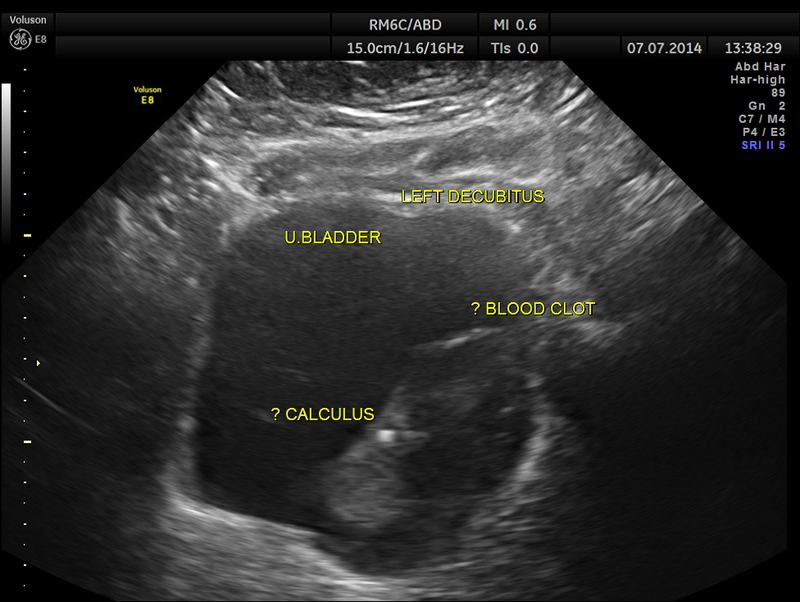 Many Sonographers would have just assumed it was a mass in the bladder and not change patient position to see if mass rolled. 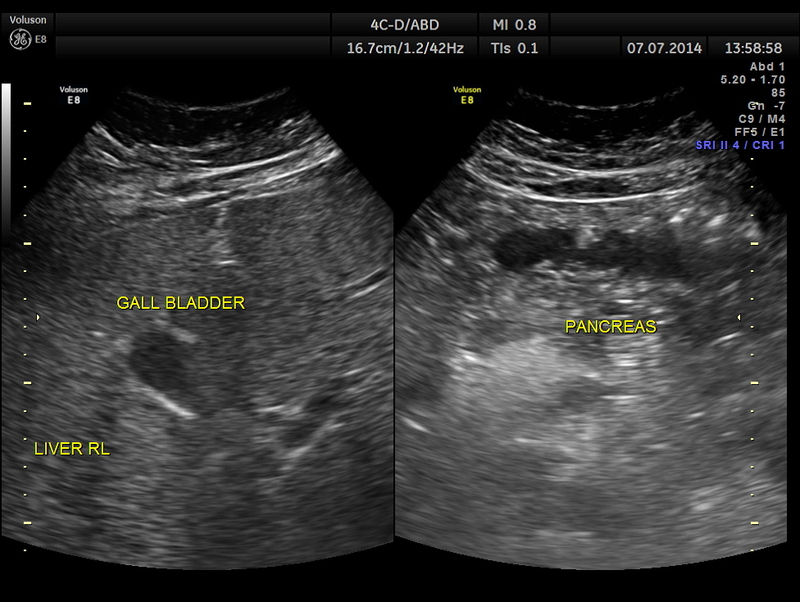 Bladder mass may mimic cystitis and hirudiniasis(leech) also. PET scan and sunitinib 50mg/day for 4weeks and repeat after a gap of 2weeks may help in clear cell RCC. 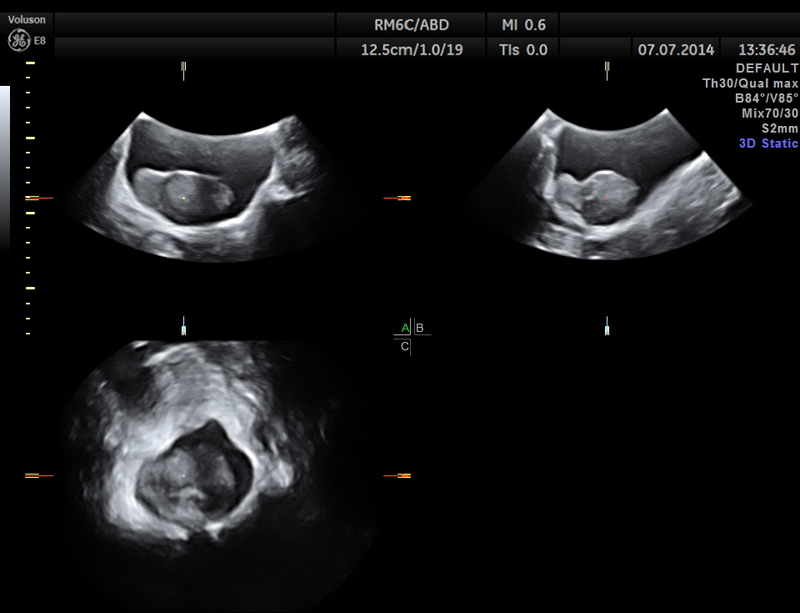 We published a case of bilateral Wilms` tumor in a girl from CNMU Rangpur,Bangladesh.